THANK YOU!!! You guys were absolutely amazing! You kept the party rocking all night and EVERYONE stayed until the end! Thanks for everything. I hear you all are playing at a friend’s wedding in Sioux Falls, SD next year so I will see you there! First of all you guys were GREAT! Thanks so much for putting on such a fun show. Everyone had such a great time at the reception and was asking,”where did you find this band, they’re awesome.” Morgan and Jackson had a blast on stage with y’all and y'all were great to to let the bride and groom be your BACKUP SINGERS!! Everyone thought that was so cool. Thanks again for your part of a fun evening. On behalf of my husband and my family, I wanted to write a special thank you to The Motion Band for making our dream wedding reception a reality. We sincerely were blown away by the band's style, how classy they were, their attention to detail, how fun and interactive they were, and their TALENT! Way more people were on the dance floor than we expected -- it was full ALL NIGHT! Also the song Perfect was seriously beautiful -- I hope they add it to their list. We felt as if everything they did, announced, and played was custom to us. It was amazing how well they fit into our vision for our wedding. We loved every single song they played and wouldn't change a thing. They were also so kind and joyful, which made a difference. We couldn't thank them enough at the end of the evening. It truly was the best live band we have ever heard (and we have been to A LOT of weddings). Everyone has been talking about our band! I would recommend this band to anyone in a heartbeat! Thank you for your management and for being so professional. You relayed everything we discussed to the band, and it 100% showed! I personally enjoyed working and communicating with you. We are so impressed and so grateful to the Motion Band for being part of our special day. The music was perfect. The energy was kept high and dance floor was packed until the newlyweds departed at 11pm. PERFECT. They were so great with the kids. Several times had the couple on stage dancing and towards the end had the entire wedding party up. Song list was great. Just perfect. Kids and adults had a blast. I can’t say how pleased we are. Exceeded our expectations in all respects. The horns following the couple out on their departure was a very nice touch! Thank you. Thank you, Thank you. Did I say Thank you? We LOVE The Motion Band. Your band was so fun all night, and the crew were the very best from the moment they arrived. I hope we are able to work with you all again in the future. I wanted to tell you how much I appreciate you and your help with booking your band for Allie and Will’s wedding on April 7. You were always so helpful and kind on the phone and just made the process very easy. I was so glad to meet you finally at the wedding too! How special that you knew my husband’s cousin too! You and the band Motion were wonderful! Everyone LOVED the music that your band performed that night. The music was great and such fun to dance to. Many people asked your band's name and I’m hoping that you will give you even more business. I highly recommend you and your group. Not only are each of you talented in what you do, but your are so nice and easy to work with. I have two more daughters and hope that you’re still singing when the next two weddings come around! We absolutely made the best choice, when we picked Motion Band for Lexi and Andy's wedding. I can't tell you how much I appreciated the fact that you sent me several links of different bands to review, and did not let on that you were part of Motion Band. I have told that story to many friends. We loved having Motion Band at the wedding, you listened to what Lexi and Andy wanted in terms of song choices and the performance level of the band was superb. So many of our guests at the wedding said Motion Band was the best they had ever heard at any wedding. (All of our kids are getting married, and we all have been to a ton of weddings in the recent years) We will definitely pass on your contact information to our friends who have children getting married or are planning a big event. Thank you again we highly recommend Motion Band! You all were fantastic, far exceeding our expectations! We will definitely reach out to you again for any of our future events! Phenomenal, outstanding, and captivating don’t even begin to cover it! Motion (Absolute Entertainment) came at the recommendation of our wedding planner, and while we were worried since we had never heard them play, our wedding planner assured us we would be absolutely satisfied with our choice. That was an understatement. This band did EVERYTHING. During dinner they were subtle and soft enough that you could hear each other talking while still being able to hear the music. They learned specific songs for the father/daughter and mother/son dances and did them really well. In my husband’s fraternity it is tradition for the guys to sit the bride in the middle of the dance floor and serenade her with “You’ve Lost That Loving Feeling” (think Top Gun, but way more off-key and slightly drunk); the band found this out about 5 minutes before it happened, and went straight into playing the background music for them, which the guys thought was super cool because no one had ever done that for them before. When it came time to dance they had a very wide selection that kept everybody dancin’ (and singin, and movin to the groovin). By the end of the night not a SINGLE person was sitting down and everyone was crammed on the dance floor having a blast. One of my favorite photos is from when they played “Shout!” and singing “a little bit softer now” encouraging people to get as low as they could, about 50-60% of our guests are seen actually laying on the ground laughing, still dancing. Finally, shout out to the sax player who was a TCU alum and played the school song AND fight song after we beat UT. It was an amazing and very welcomed surprise for a wedding filled with Horned Frogs. It has been over a month since our wedding and we are still getting rave reviews on how amazing our band was. Motion added an awesome soundtrack andatmosphere to an already spectacular night. They were the cherry on top! Motion Band was absolutely phenomenal! We could not have picked a more perfect band. We asked for jazz music and that is exactly what we got! Every band member was so fun to interact with and seemed to enjoy our celebration as much as we did. Thank you to all of the band members for interacting with our guests and making us feel special. I will be recommending Motion Band and Absolute Entertainment for years to come! We also used a String Trio through Absolute Entertainment that was absolutely wonderful. Our wedding day was over cast and when the sun began to peak out before the ceremony the trio stopped in the middle of the song and played "Here comes the sun". Every one of our guests loved it and the music was so beautiful. Stacie, it makes me tear up thinking about how perfect the whole day was and it would not have been complete without each of your musicians and especially you. I had a blast singing with you, thank you for letting me do that even though I can't carry a tune to save my life! Tyrrell teared up during the whole sweetheart dance, you sung "Come away with me" beautifully. We loved that you all personally sang "No Diggity" I was convinced it was going to be the sound guy playing the song! Words fail to express how perfect it was. I wish I could hug you again!! Please tell the band (Motion) that I am holding them personally responsible for… me being such a bad host to our guests, for my sore calves, and for the embarrassing sweaty mess I am in the videos. We just could not get off the dance floor! They sounded fantastic and had such great energy!! They really listened to us and played everything we requested. Motion truly exceeded our expectations. Our guests had a blast and everyone (even our Houston guests) wanted to know who they were. We really enjoyed the piano player at the cocktail reception. Thank you for making this such a fun evening for us! We’ve received nothing but rave reviews for The Motion Band…you were a Big Hit and an important piece to the overall success of our event – a thousand thank you’s!!! I know it's been a few weeks, but I just wanted to reach out and express my thanks to you and the Motion Band for playing at our wedding reception on 2/18. We received SO many compliments on the band and all the songs, and I had an absolute blast (everyone kept telling me my own wedding would be more stressful than fun and that was not true at all-I danced practically the whole night). Everyone had a great time, and I know the band and their music was a huge part of that. They even accommodated one of our guests who wanted to sing Shout (it was hilarious). Thank you so much for everything and we would recommend Motion to anyone! Absolutely incredible. Our reception would not have been the same celebration it was without the Motion Band! We also used Absolute for lighting, and they made it absolutely perfect- including a outdoor ceremony that lasted from sunset into night. The lighting team was wonderful to work with! Thank you soooo much for everything that you guys did that night!! Everyone was sooooo helpful! You guys were rocking!!! I heard NOTHING but good things about you guys seriously! I’m so glad to have met you! I will recommend The Motion Band to anyone who asks!I know I didn’t realize they were such dance stars lol!!! Thank again Stacie you made the evening 10 times better even when it was just the recorded music! Also can you personally thank Joe for me…he’s AMAZING!!! Can't begin to tell you how wonderful Motion was at Diane's Wedding! From the minute we got there to the minute we left they had the crowd on the dance floor having so much fun!Please pass on my thanks to them! I have given their name to about 25 people so hopefully they will be really busy in the next year!! Thanks again for all of your help! Just wanted you to know that Motion could not have been better for our wedding reception. You cannot believe all the great comments I got...everything was SO FUN!! They got the timeline/announcements perfectly. Were great musicians and had the crowd on their feet the whole time. I, for one, have blisters because I just couldn't leave the dance floor! We are so grateful to you in the first place for being considerate of allowing us some flexibility in our picking of a date. And, very grateful for the artistry and professionalism of Motion! We cannot say enough amazing things about Motion's performance during our wedding this weekend- they were incredible, and made our wedding perfect. We had guests who are normally early to bed stay all night because the music was so good and guests joking they felt like they were at a concert it was so much fun! "Motion was amazing! So much energy, the dance floor was always full. The first dance songs were spot on." Motion! Excellent presenters, singers…they were amazing with the guest, love how they got on the floor and danced and sang. The gentleman(dont know his name but red hair and beard) was a dream…When I arrived with the Bride and Groom this was our first meet. Everythime i went to the stage to ask him something or talk about the game plan , he couldnt give me faster attention..Again, made me feel like a vip client. He made my job easier with no stress. They were fast to set up and clean up. Very professional. I hope very much we get a chance to work together again. BTW..I better add - our mutal client was extremly happy! “Stacie, I thought the band was absolutely fabulous!!! And you and the entire crew were such a pleasure to work with. All I have to pass on is many good thoughts and compliments." "I booked The Motion Band through Absolute Entertainment for my wedding. The Motion Band did an A.M.A.Z.I.N.G. job for the entertainment at our wedding! Every single person that I talked to during and after the wedding commented on how great the Band was. The entire time the dance floor was packed and the music they played was enjoyed by all ages. I enjoyed every song they chose. I also felt like they were committed to involving the crowd the whole night and they came off stage several times to dance and sing with the everyone! I even got to sing with them, which everyone probably wished I hadn’t :). I cannot thank them enough for their performance. Everything was perfect at our wedding and they took it to the next level. We were concerned at first about the cost difference between a DJ and a band but I can tell you we all think it was worth every single penny and made such a difference to the overall feeling of the night. I have already referred the Motion Band to two different people – one wedding and one gala - and I know several others who want to use them for their work/personal events! They are the best and I highly recommend them to anyone!!! There are not enough good things I can say about them!! They were AMAZING and exceeded my expectations. I think people thought they cost us 3-4 times what they actually did. They rocked the house and people are STILL raving about them. Please know that and forward my enthusiastic thanks and pleasure with their show. We loved the band and received so many compliments about how fun they made the wedding. We couldn't be happier to have picked them! I just wanted to thank y'all for the awesome job you did at my wedding Saturday night. I keep hearing from people about how much they enjoyed the band, and I whole heartedly agree. I especially appreciate you learning the song Simple Man for my dance with my Mom. It was everything I imagined it would be. Thanks from the bottom of my heart for making my wedding something I will never ever forget. You were great. The event went so well. The band had the crowd on the dance floor all night till the end. I have heard so many comments from all age groups about how good they were. Lots of older folks made that comment also!! We had a large crowd that night and many more stayed later into the evening, those that usually are gone by 10:45-11:00 were still there until much later. We also had a large group of college kids and they stayed on the dance floor but there lots of other aged folks out there too. It was a great evening and I would highly recommend them again. Hope they had fun. I never went to introduce myself, I was having too much fun too. Thanks and please pass my kudos along to them. Just wanted to chime in on Motion and how fabulous they were!!! We have gotten tons of compliments on how fun the reception was!! They played a great assortment of music, they got down on the dance floor and engaged the crowd right down to marching Katie and Grant out at the end:) And even though I really only worked with you at the beginning then Kt took over-you were so nice and accommodating! We feel like the wedding and reception was a big success partly because of your help!! My cousin plans her big office Christmas party every year and said she was going to contact you about them playing! I am putting June 11th on our calendar-we will be jammin' at Vitruvian that night with them again:))!! The Motion Band was great! My daughter and her friends had a fabulous time. Everything went off without a hitch. Thanks for everything. The wedding was absolutely fantastic and once the band started playing, the dance floor stayed full the whole night. Emily and Alex had a wonderful time and the last song they stood on the stage and danced and sang with band. I cannot wait to see the pictures. When I saw the floor was full and everyone was dancing and having a wonderful time, I thought to myself, "they were worth every penny and more!" So my hat is off to you - thank you! When I get the pictures back, I would love to share them with you -the photographers took a ton of the bride and groom dancing and I think they are going to be great! Best of all, my bride said the party was amazing. Thank you so much and please know I will be recommending you to everyone I know. I just wanted to write and let you know what a fabulous job Motion Band did at Hilary's wedding last month. They started out with some slower (and older) and more melodic songs and gradually ramped up the energy as the night wore on. It was a perfect progression. I heard praises from a lot of my guests, both at the wedding and in the days following. Every comment I got and every comment Hilary got was completely positive. Please pass on our thanks to them for doing such a great job. I can't wait to see them again at Emily's wedding next April. We wanted to reply and let you know how great the band was! The guests were on the dance floor all night and everyone continues to rave about how entertaining the band was. We've passed the band details along to a few friends that had inquired but we're more than willing to provide a reference/quote, anything you guys need or would find beneficial. Please let the band know how grateful we are. The band was off the charts this past Saturday. My husband and I attended the Soiree and the band rocked the house. So excited to have them back in Beaumont. Motion was just awesome! Everyone said they were fabulous and had the best time, they could not stay off the dance floor. In fact, we are already planning to book the country club for our holiday party next year and would like to book Motion for our entertainmentagain! Thank you so much for a wonderful party!! Motion was awesome! I have to admit the night was a big blur to me for the most part, but I remember having lots of fun on the dance floor and getting a lot of compliments on the band. We had a great time and were very happy with their performance. There was not one problem and it was nice to relax and have fun on the dance floor. "They were incredible!! We've had so many rave reviews!!!! At one point I think we had 300 + on the dance floor!!! The high school kids and all loved it!!! Thanks to all !! Our ball chair and over-all chair are cced on this." "We thoroughly enjoyed the Motion again! They were really awesome and the crowd had an awesome time! Wish you could have seen them in action – truly an awesome night!!! Thanks for everything! We are so glad we picked the Motion once again!" "We just got back from our honeymoon (which was awesome!) and wanted to reply before I forgot. Both the string quartet and the Motion band were INCREDIBLE! I cannot say enough about how perfect they both were! From the minute I heard the strings begin to play, I got tears in my eyes. It was absolutely beautiful and exactly what I had envisioned for the ceremony. THANK YOU!! As for the Motion band.. People are still raving about them! They really brought the party to life and kept the dance floor packed all night. They did a great job reading the crowd and keeping everyone entertained the whole evening. What an incredible group of musicians and vocalists - WOW! Having them perform our first dance song live was such a cool experience. Thank you times a million to both the string quartet and the band! They were exactly what I wanted for my wedding and would HIGHLY recommend both!" "The band was phenomenal. First and foremost, I was thrilled that they were able to learn (and ace) the two songs we requested - both of which are obscure by party band standards, I'm sure! It meant so much to me, and was a personal highlight. Beyond the first two dances, I received rave reviews from so many people! Needless to say, I'm so grateful to you for reaching out to me and letting me know when they became availabe. The reception truly would have not have been the same without them. I look forward to recommending you and The Motion to anyone and everyone I know who's looking to throw a great party!" "We were absolutely thrilled with the Motion and the lighting provided by Absolute Entertainment. Our wedding was a ton of fun and many of our guest said the same (and not just being complimentary - they were serious!) We are still getting compliments about what a fun reception we had! We will definitely recommend Absolute Entertainment, and more specifically, the Motion to anyone looking for reception/event entertainment and/or lighting. Great job!" "Motion made the wedding. We hired Motion through Absolute Entertainment, and they were a huge hit! We still get compliments about the band, and they were great about adapting to our guests' moods. (In other words, they knew when to tone it down, and knew when/how to amp it up.) I REALLY appreciated them for learning two new songs, both of which were pretty obscure. And, they did a flawless execution!" "The band was GREAT!!! I have had some e-mails and phone calls wanting to know who the band was for the party... A party is only as good as its band and our party was a huge success. I think they even kept our bar bill down since everyone was on the dance floor the entire night." "I just wanted to take a moment to tell you that Motion was wonderful at the party Saturday evening. I can’t tell you how many comments we received from our guests about how fabulous they were. I don’t think our guests ever wanted to stop dancing." 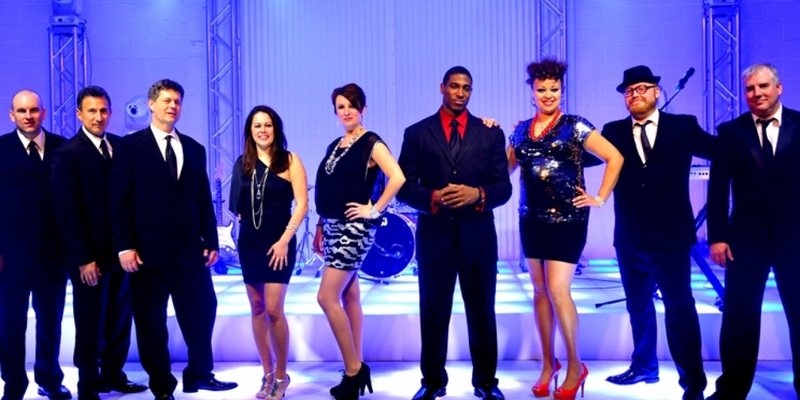 "Motion is a fun, high energy band that kept the guests on the dance floor! We enjoyed them so much we have booked them for New Year Eve, one of the Club's biggest parties of the year." "One of the reasons I was so pleased with Motion was their ability to read the crowd. It takes real skill to successfully read a crowd’s reactions and keep the party going without alienating people based on ages or musical preferences. Motion kept things changing like a 10 speed blender and no one left the party. Further, they were cognizant of their sound levels and deftly shifted from tune to tune and style to style without me shouting that they were, “Too loud,” or asking to turn it up. In short Steve, thanks. Motion made me look like a hero, and I will be using them again many times in the years to come." "I recently went to a wedding your band played at and LOVED every minute of it. You were wonderful and made our night a blast. I would love to use you for my wedding"